Tuesday, August 21, 2018 Craig will lead a drumming circle for adults at 5:30. Absolutely no experience is needed to participate! Come with an open mind and the desire for a positive physical and emotional experience. Used as a tool to promote unity, rhythm is a universal language that encompasses all ages, races, religions, and cultures. If you’ve never tried this, now is your chance! Since the dawn of time, drumming has been associated with bringing about positive physical, emotional and spiritual well-being. Anyone who has laid hands on a drum will tell you it makes them feel better. Craig offers MBS Community Drumming (Mind/Body/Spirit) for wellness programs for all to experience the uplifting joy of rhythm. When you are in sync with your body and mind, you can expect to be healthy. When life is out of rhythm, there will be problems with health and relationships. Drumming helps to align our bodies and minds and connects us in many positive ways. 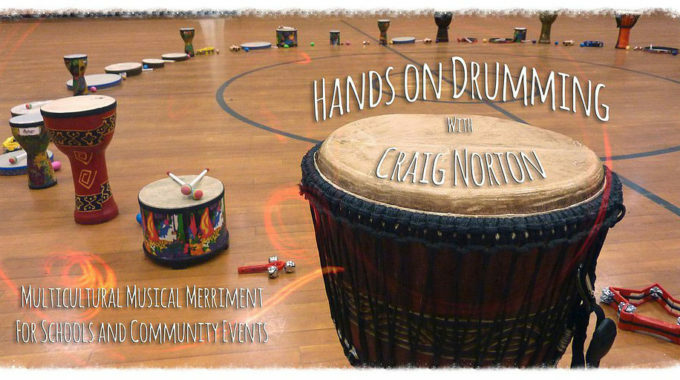 Craig Norton started “Hands on Drumming” in 1998, offering community drums circles throughout CT. A few years later he joined up with Virginia Anderson to launch Playtivity as a full time business doing drum, dance and storytelling programs in schools, libraries, hospitals and community events throughout the Northeast US. Playtivity had the opportunity to play for hundreds of thousands of people of all ages. Hands on Drumming now specializes in participatory drumming in schools, libraries, museums, corporate retreats and wellness programs and community events. Craig Norton is endorsed by Remo Drums. 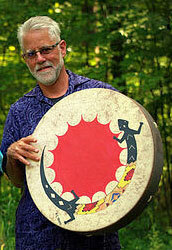 Craig also plays percussion in a variety of bands including Cosmic Hue, Bodhi Groove and Kalidasa Kirtan. From April to September he leads the Circle in The Square Drummers in Blue Back Square, West Hartford. He has studied or played with Babatunde Olatunji, Mickey Hart, Andelique Kidjo, Glenn Valez, Arthur Hull among others and performed for a ceremony honoring Bishop Desmond Tutu. This is not a job or hobby for Craig. It is his life’s passion to share the power of the drum with everyone.